inSpirit: UUA Bookstore and Gift Shop: Who Will Remember Me? 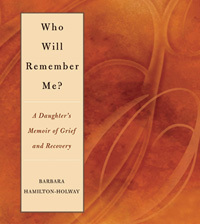 After the death of her mother, Hamilton-Holway captured her own journey through loss and renewal. Speaks to the challenges and rewards of caring for an elderly loved one. Meditative in tone, Who Will Remember Me? reminds us that from loss we can also discover a new beginning. I have come to bring you bitter news. This is the story of my relationship with my mother, a story of both separation and connection. Much of what I know about love and power has come from my relationship with my mother. In sharing the story of my own life?as a daughter, a mother, and a parish minister?I hope to convey my sense of an abiding relationship, a presence known by many names and no name, which some call God.